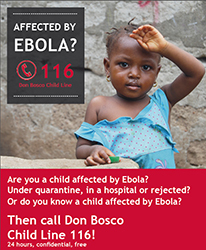 (ANS – Freetown) – Since 2010 Don Bosco Fambul has been offering the countrywide phone counselling. “About half of our counselling sessions in normal times deal with relationship problems of young people. In this period of finding their identity the young people particularly depend on good and confidential counselling,” the Director of Don Bosco Fambul, Brother Lothar Wagner SDB, says. He and his staff, however, had not been prepared for what happened last year. “At the beginning of the Ebola epidemic the children asked for the symptoms and for protective measures. From September 2014 on we merely became a crisis intervention centre,” the 41-year-old theologian and social worker said. Now he is glad that normality is slowly returning. Via radio jingles and awareness campaigns taking place since May 2014 young people have been encouraged to call the free hotline 116 in order to get good information about Ebola. About 25,000 calls have since then arrived at the switchboard of the Don Bosco Line 116 in Sierra Leone's capital Freetown. Swiftly, the data were gaining in significance for the national registration office, allowing a quick identification of the hotspots and crisis regions. Accordingly, the head of the telephone counselling department maintained permanent contact with the Ministry of Health and the Ministry for Social Affairs as well as the Ebola command centre. Moreover, food deliveries to the quarantine zones were organised quickly, also through contacting local partners. In this respect, the project of Don Bosco Fambul gave new hope to the children and adolescents in one of the poorest country in the world in oftentimes seemingly hopeless times of crisis – also for Fatmata and Samuel. Both children lost their parents by the Ebola disease. They had contracted Ebola themselves but could be healed. The relatives looted their homes. Neglected and without hope they languished in a hospital in Port Loko until Fatmata recalled one of her teachers talking of the Don Bosco Child Line 116. Quickly, she began to trust in the social worker of Don Bosco Fambul and immediately assistance was provided. The children were cared for at the Don Bosco Interim Centre near the International Airport of Freetown. In the meantime, both children have returned to their relatives and attend to school. Their parents’ homes have been renovated and both receive family-supporting services.